Fresh off his adventure where he saved Forest Noel from the evil G.R. Inchworm, Maury Chris Moose is back and facing another struggle. When a new social media site invades the forest, Maury, Mikey & the rest of the gang learn an important lesson on how to use social media and cell phones. Find out what causes two best buddies to get into a fight and follow Maury as a flip-flop-wearing bug teaches him what is takes to be a pal. 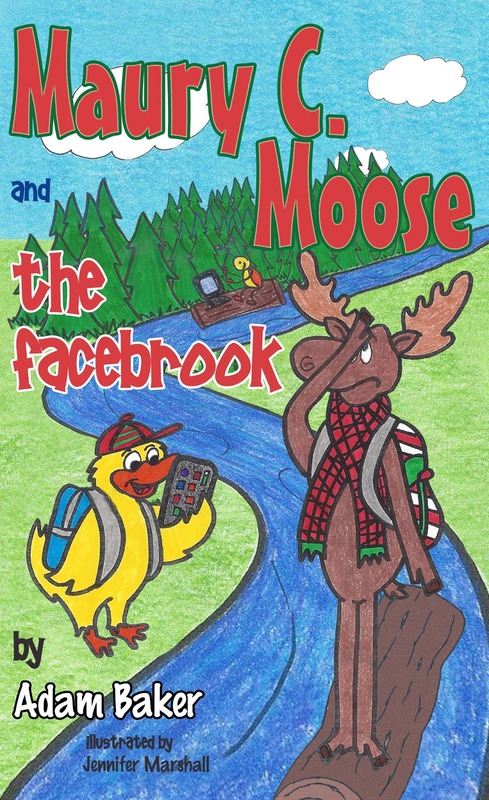 The second book in the Maury C. Moose series continues its fun use of parody, puns, and rhymes to teach kids the value of appropriate use of technology. Join Maury and friends and find out what can happen when we jump to conclusions and do not pay attention to those around us. This chapter book features the perfect mix of humor for adults and childhood whimsy to create a story that kids and parents will love reading together. Adam Baker likes pretzel bread, sleepwalking & lists that include three examples. He first wrote a published story at age 3. The story was titled "Batman & Ghostbusters" and by published we mean that his mom stapled a few pages together and called it a book. This helped create a love for writing that led him to create the Maury C. Moose Series. One lucky winner will receive a print copy of the book. Giveaway ends 12/10. Winner will be notified by email, and will need to respond within 48 hours. The prize will be sent directly from the author. Would love to win it for my 6 grandkids! This looks like a really cute book! I think my daughter would really enjoy it! My little boy would love this. He loves animal cartoons and all of his favorite books have similar coloring. i would love to add this to my daughters book collection for them to read. I would love to win this book for my grandson!! My grandson would enjoy this book. Thanks for the chance to win. This story looks cute! I would love to gift this to my niece and nephew. Thanks for the review. kristiedonelson(at)gmail(dot)com Thank you. This looks like such a cute book. I think it would be an instant favorite. Looks like a cute book! Thanks for the chance to win! My daughter is just starting to read. She loves it when I read her books. This book looks really cute! My six year old son would really enjoy it!! This book looks so cute. The illustrations are adorable. My Granddaughter would love it. The book looks cute. I love giving my grandaughter books. She is only one but she loves them. This looks like a cute book and something that my oldest granddaughter would really like to read. Thanks for the chance! My daughter is always looking for new books to read! This would be great!